Motor rallies have been run in the Alps since the early 20th Century. While many of the famous Alpine routes of old are now major trunk roads, we have used our extensive knowledge to find little known mountain by-ways that still evoke that pioneering era of Alpine motoring. True to its historic roots, the 2018 ‘Alpine’ will ensure competitors enjoy great driving roads, magnificent scenery and a challenging time schedule. As in previous years, the 2018 Alpine Trial is divided into three distinct ‘loops’, each one designed to give you the full flavour of this beautiful and interesting area of France. We have included enough time in the daily schedule to allow for a refreshment halt in the morning and afternoon, plus a longer stop for lunch. These are often in traditional wayside establishments, which help add character to the event as well as giving much welcome trade to remote rural communities. Like the 2016 edition Alpine, the 2018 Alpine Trial starts from Divonne-les-Bains, a quiet unassuming spa town about 20km north of Geneva airport. Once again the Rally Headquarters is in the comforatble Art-Deco splendour of the Domaine-de-Divonne which, with its adjoining casino, was originally built to cater for the gambling habits of the Swiss just over the border. This hotel provides the perfect base for two nights as we explore the delights of the Jura Mountains before moving to the Hôtel L'Impérial Palace in Annecy for the final sections in Haute-Savoie. As usual, all liaison sections will be navigated using a Tulip Routebook. However, in keeping with Alpine rally tradition, the Regularity and Alpine Sections use traditional maps with the route clearly pre-marked on them. 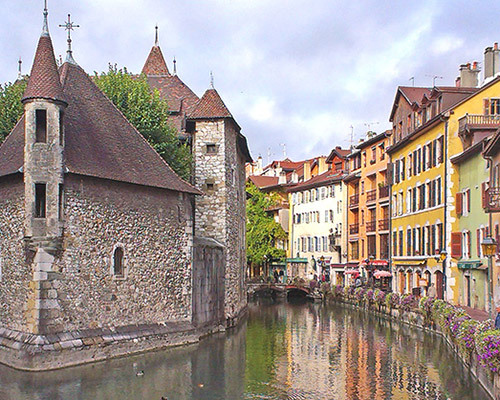 If you don’t want to go into Switzerland there are only two ways out of Divonne-les-Bains, and both involve climbing the 1500m high ridge of the Monts Jura that lies immediately to the west of Divonne. However, once over the top, you emerge onto a high plateau of rich pasture and dark forests bisected by deep river valleys and flanked by towering limestone cliffs. Sweeping their way through this scenic landscape are a network of empty roads that are just perfect for vintage motoring. In winter, the Jura is a bare, lonely landscape, favoured by cross country skiers rather than their more glamorous downhill counterparts. However, in summer these lush pastures come alive with wild flowers while in autumn the surrounding forests are a blaze of colour. Montbeliarde and Simmental cows graze leisurely in the fields, their milk going mainly into the production of Comte cheese for which the area is famous. It was among these herds and the vineyards around his home town of Arbois, that locally born Louis Pasteur did much of his research, although ironically traditional Comte is made from unpasteurised milk. A couple of morning regularities take us to a welcome coffee break on the banks of the Ain, before we move into the lanes to the west of the river for the first, timed to the minute, Alpine Section of the event. This sees us circling back to enjoy lunch and a test near Moirans-en-Montagne, the toy manufacturing capital of France. After climbing into the Jura once more we turn south down a broad mountain valley to the first regularity of the day across the mountains between the Valserine and Semine valleys. Continuing south, we enter the Bugey, a remote area of wooded mountains virtually encircled by the River Rhone. Morning coffee is at a remote family run mountain auberge with the most fabulous views across the Rhone to the snow-capped Alps, with the peak of Mont Blanc prominent on the horizon. From there it's a short run to the first test of the day, which, if all goes to plan, could be a first for the Alpine. Although not high by Alpine standards, the hills of the Bugey offer some stiff driving challenges; the hairpins will become more frequent as the day goes on… After skirting the very edge of the deep Cluse des Hôpitaux, we climb to a tiny village for lunch at a rustic hotel run by three generations of the same family. Dropping down into the Clues de l’Alberine gives us a chance to pick up fuel before starting the climb into the southern section of the Bugey, with expansive views west as far as Lyon, some 50km away. After regaining the valley floor once more there is a brief respite through the country lanes before tackling the final major climb of the day over the Grand Colombier ridge. Then having stopped for ‘afternoon tea’ and and crossed the Rhone, all that remains is a run through the hills of the Albanais - until 1960 the most important tobacco growing area in France - and on to our hotel for the next two nights; the luxurious Hôtel L'Impérial Palace right by the water’s edge in Annecy. The massive snow-capped peak of Mont Blanc dominates everything today, and will be our constant guardian as we explore the mountain roads around its flanks. Day three kicks off with an easy lakeside run before the competition gets underway with a short test followed by a testing regularity on the roads around the Vallée de Manigod. After descending into the valley of the Arly the route then takes in a series of testing sections overlooking the 1992 Winter Olympics town of Albertville. From lunch, we head south west along the flanks of the Isère valley before climbing into the Massif des Bauges National Park. 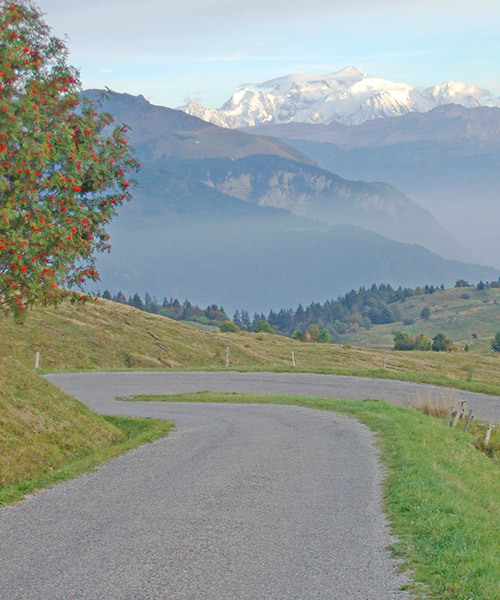 No ‘Alpine’ would be complete without a final climb of the 1600m Montagne du Semnoz to admire the superb mountain scenery on offer. All that then remains is an easy descent into Annecy and the grand lakeside finish. I can safely say that in the 35 years I've been rallying I have not taken part in a rally that was so well organised and friendly as the Blue Train. The road book set new standards that helped those new to the sport, but in no way lessened the competitive element for the experienced.